God breathed life into creation. He spoke and everything came into being. He called it good. By the time he decided to rest things were perfect. Perfect because everything was in the right relationship to him. Conceptually, I probably could have drawn almost anything this Sunday and it would have been applicable due to the fact that I was bringing an image into existence on a piece of paper. However, I chose to draw a plant. A plant because we are to be stewards of God's creation. We get to participate in the care of God's creation. There is a directional flow from the bottom of the drawing springing up to the top. 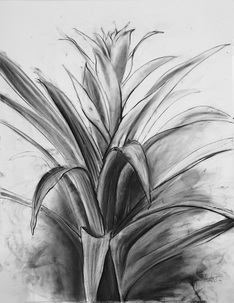 This was a very physical drawing requiring lots of push and pull with the charcoal. My intention with that physicality was to bring in energy and a movement to capture the idea of becoming. God is life-giving. His plan and prescription for us is to enjoy and glorify him. His prescription will generate life, beauty, and praise. Praise God from whom all blessings flow.